Near-wellbore fracture tortuosity has important impacts on the productivity of fractured oil and gas wells and the injectivity of CO2 or solids disposal injectors. Previous models for simulating near-wellbore fracture tortuosity usually assume fracture growth in linear-elastic media, without considering the effects of porous features of the rock. In this paper, a 2D fully coupled model is developed to simulate near-wellbore fracturing using the XFEM-based cohesive segment method. The model takes into account a variety of crucial physical aspects, including fracture extension and turning, fluid flow in the fracture, fluid leak-off through wellbore wall and fracture surfaces, pore fluid flow, and rock deformation. The proposed model was verified against two sets of published experimental results. Numerical examples were carried out to investigate the effects of various parameters on near-wellbore fracture trajectory, injection pressure, and fracture width. Results show that near-wellbore fracture behaviors are not only dependent on rock elastic properties and field stresses, but also greatly influenced by porous properties of the rock, such as permeability and leak-off coefficient. Some field implications were provided based on the simulation results. 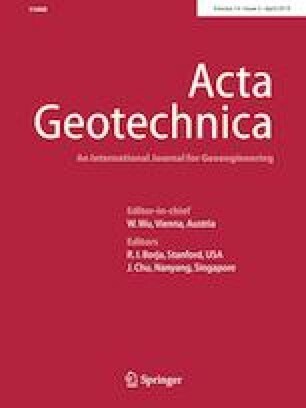 By overcoming some limitations of the previous models, the proposed model predicts more realistic fracture evolution in the near-wellbore region and provides an attractive tool for design and evaluation of many field operations, for which near-wellbore fracture behaviors play an important role on their successes. The authors wish to thank the Wider Windows Industrial Affiliate Program, the University of Texas at Austin, for financial and logistical support of this work. Program support from BHP Billiton, British Petroleum, Chevron, ConocoPhillips, Halliburton, Marathon, National Oilwell Varco, Occidental Oil and Gas, and Shell is gratefully acknowledged. Thanks are due also to Dr. Evgeny Podnos for his manuscript review and suggestions.